This week, we’re going to take a look at another way to write and share content, but this time in the form of wikis. First, though, let’s look at what makes blogs and wikis different. With a blog, there is generally one poster (writer) who then allows comments to the post – like we’re doing here. No one is allowed to make changes to a comment or post made by someone else. With a wiki, anyone with access to the wiki has permission to make changes to the content. If you choose not to limit access to a particular group or membership, anyone in the world can make changes. Here is a short video on Wikis in Plain English. In MCS, both the K-4th and the 5th-8th grade math leadership teams are using wikis to share resources with each other as we transition to the new Alabama College & Career Readiness Standards for Mathematics, as well as new textbooks. You can look explore the 5th-8th wiki here http://mcsmath5-8.wikispaces.com/. Take a look at this list of 50 Ways to Use Wikis for a More Collaborative and Interactive Classroom. Try to find at least two ways that look interesting to you that might work with your curriculum. 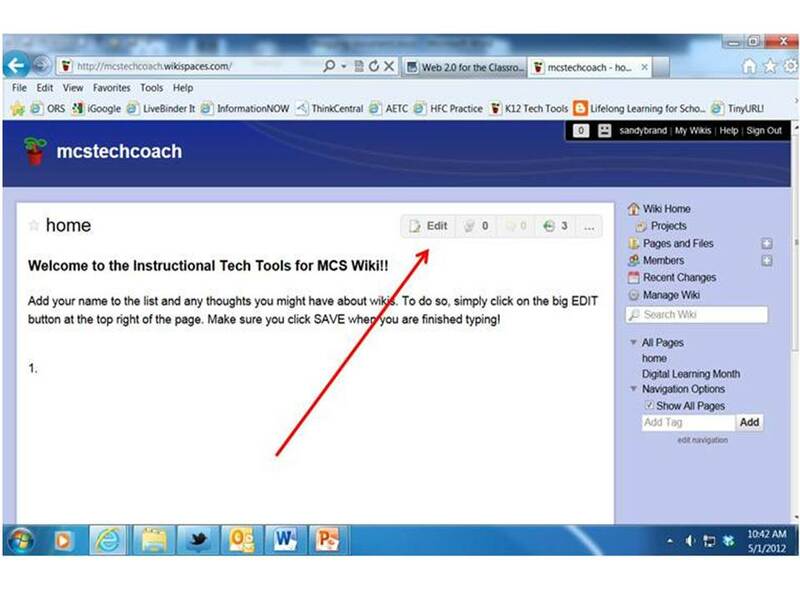 Visit the Instructional Tech Tools for MCS Wiki and add your name to the list. To do so, simply click on the big EDIT button at the top right of the page. Make sure you click SAVE when you are finished typing! (The instructions are also on the wiki page.) As always, if you have any questions, don’t hesitate to ask me!! That’s it for this week! What do you think about wikis? What are your thoughts about blogs vs. wikis? Week 1, May 2nd: Let’s Get Started! This is Week 1 and, since it’s the Introduction to our series, it only makes sense that we start out talking about blogging! Your only task this week is to register for a WordPress account if you don’t already have one. Having an account will allow you to comment on these blog posts. You may also want to use your WordPress blog later on, either as an individual blog or as a place to share with your students. 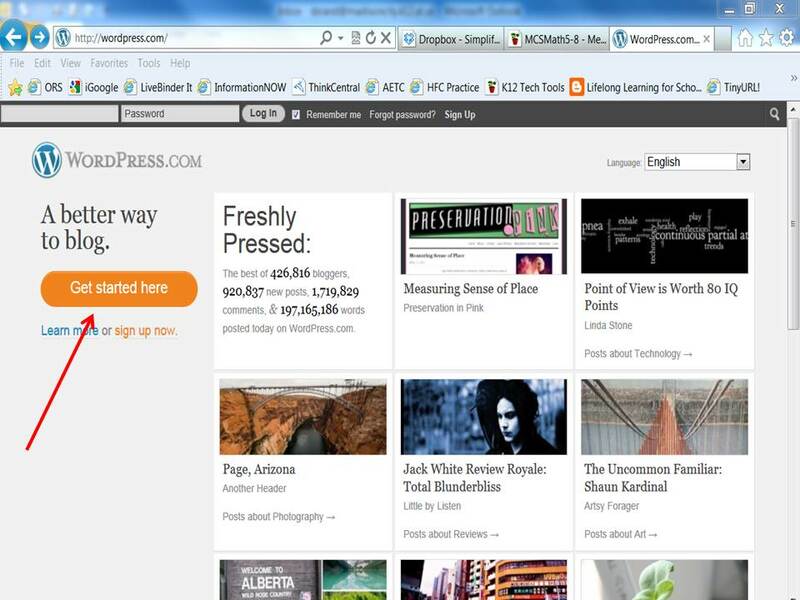 WordPress is a web-based blogging platform. Some others are Blogger, Edublogs, and Tumblr. To set up an account with WordPress, you can use any username and password you want. You will be using this account to comment on these posts, so try to pick a username that will easily identify you. You will be asked to choose a name for your blog but don’t worry too much about that part – you can always go back later and change it! As always, if you need help with the sign-up process, let me know! We’ll talk more about blogging next week so, if you have any questions in the meantime, be sure to post them! See you next week!